The entry level 110 cc scooter segment is a very big market in India and all the brands take it very seriously. Honda is one such brand which understands how they can increase their reach. And to do the same they have started sub categorizing their products ( 110 cc segment automatic scooter ) to get a more focused market. Honda Navi is one such example. 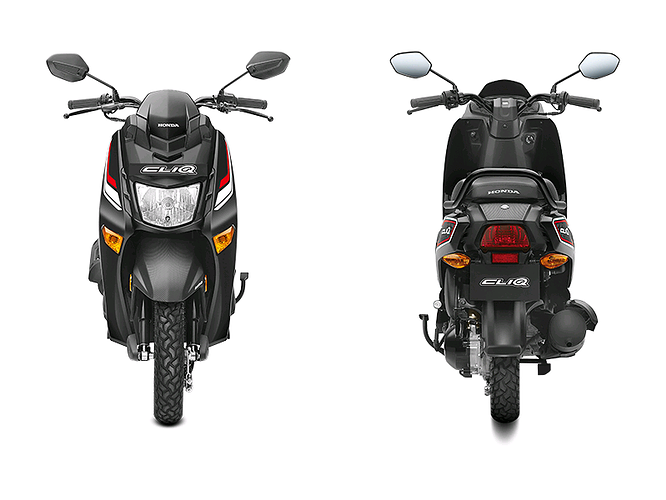 The Cliq is the latest addition from Honda in the scooter line-up. The lightweight scooter weighs 102 kgs and it has a narrower body frame even then the Activa i. The new scooter is also conventionally 6 kgs lighter than the original Activa. Honda Cliq is powered by a 109.19 cc engine which generates a maximum power of 8 bhp @ 7000 rpm and produces a maximum torque of 8.94 Nm @ 5500 rpm. With a fuel tank capacity of 3.5 litres it delivers mileage in the range of 42 kmpl to 52 kmpl. Honda Cliq will be available in four shades of Patriotic Red, Morrocan Blue, Orcus Grey and Black. It will be available at a starting ex-showroom price of INR 42,499.